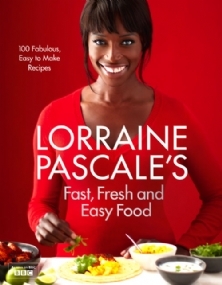 I recently bought Lorraine Pascale’s new recipe book. I have her other 2 and the recipes are really yummy, both savoury and sweet. Her Oreo cookie brownie is a particular favourite in our household! So when I bought the new one I was excited to try some of her new baked goodies! 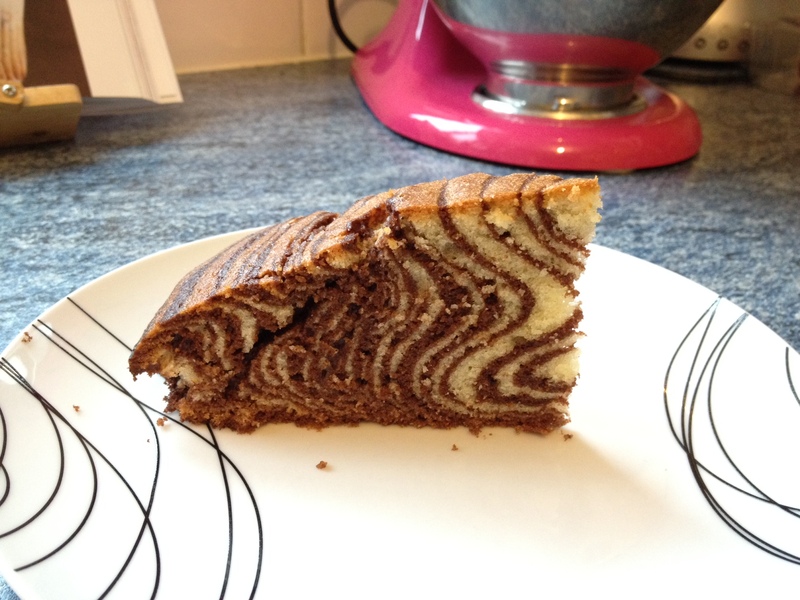 The ‘Crouching tiger, hidden zebra cake, stood out to me, as I have been hooked on this year’s Great British Bake Off, and the hidden design episode was brilliant and sparked a desire for me to try something with a cheeky surprise inside. The finished cake looks so impressive, and while it take a little time to do the step which creates the zebra stripes, it’s actually a pretty simple recipe! 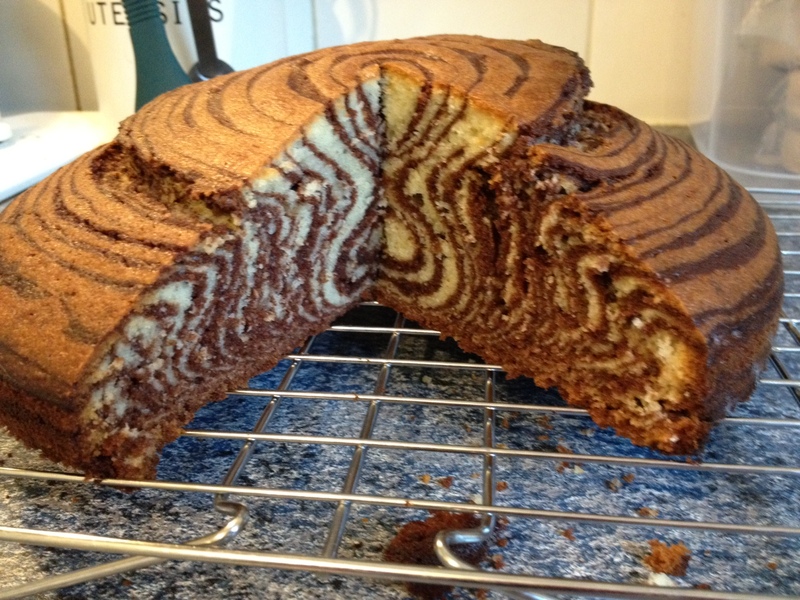 The recipe makes 12 slices and requires a 23cm springform sandwich tin. Preheat the oven to 180 degrees C (fan 160 in a fan oven), 350 degrees F, gas mark 4. Grease the bottom of the sandwich tin with a little oil, line with baking parchment and oil again. Set aside on a large baking sheet. Sift 175g of the self-raising flour into one bowl along with 1/2 teaspoon of the baking powder. Mix well and set aside. This is your vanilla mix. Sift the remaining 125g of self-raising flour and 1/2 teaspoon of baking powder into the other bowl along with the cocoa powder. Finely grate the orange zest in. mix everything together well and set aside. 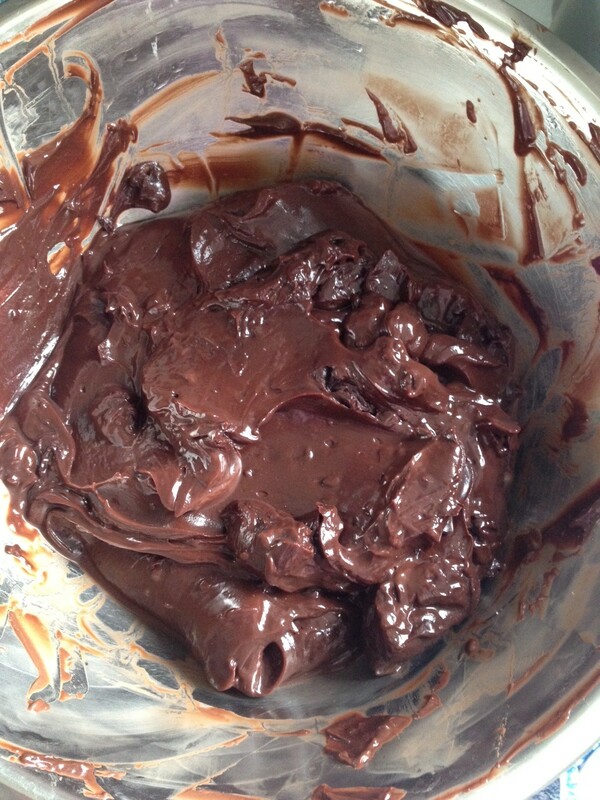 This is your chocolate mix. Now, put a tablespoon of the vanilla mix in the middle of the tin. Then, using a clean tablespoon, put a blob of the chocolate mix in the middle of the vanilla one. 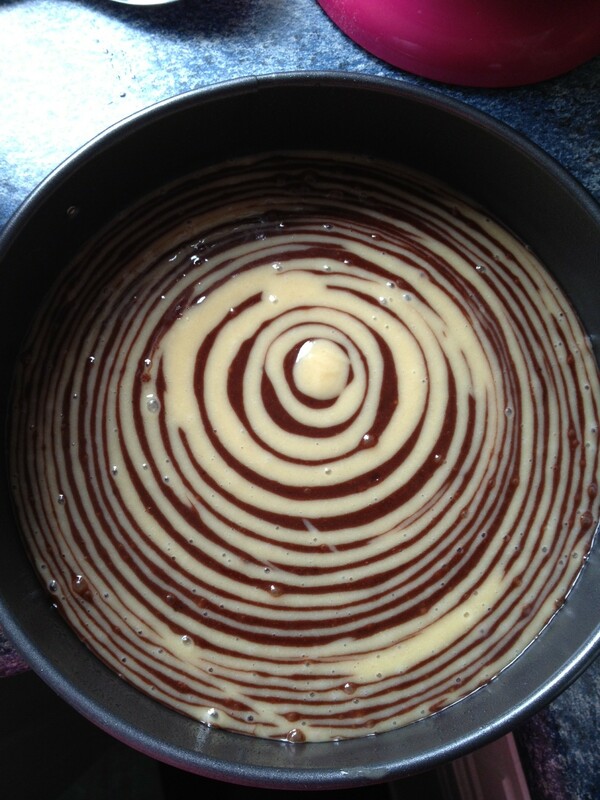 Keep doing this, alternating between vanilla and chocolate, so you form a type of ‘bulls eye’ look. 7. 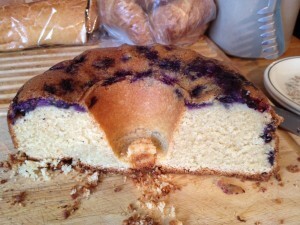 Each time you dollop a blob in, the whole mix will spread out on the base. By the time you have used up both of the cake mixes, they should have just reached the edge of the tin. 9. 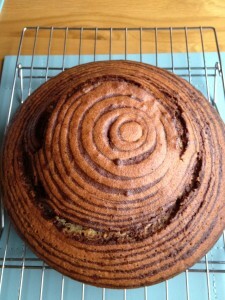 Check the cake is cooked by inserting a skewer into the centre. It should come out clean. If not, then return to the oven for another 5 minutes or so until cooked. Once cooked, remove from the oven and allow to cool for a few minutes in the tin. Then carefully remove from the tin and leave to cool completely on a wire rack. 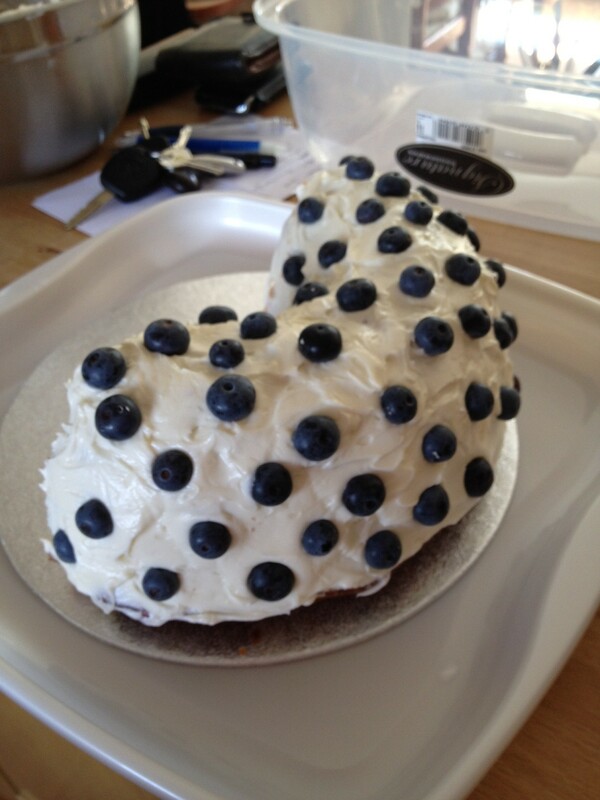 It’s a really yummy cake, and the slight orange zesty taste is lovely! It’s particularly good when it’s still slightly warm from the oven! It’s really moist & perfect with a brew! This recipe is one that immediately stood out for me from the Hummingbird Cake Days recipe book, so has been on my ‘to bake’ list for a while! However, it was seeing a post on one of the blogs I read by Little Miss Hungry (http://littlemisshungryuk.blogspot.co.uk/) that prompted me to finally get baking it. 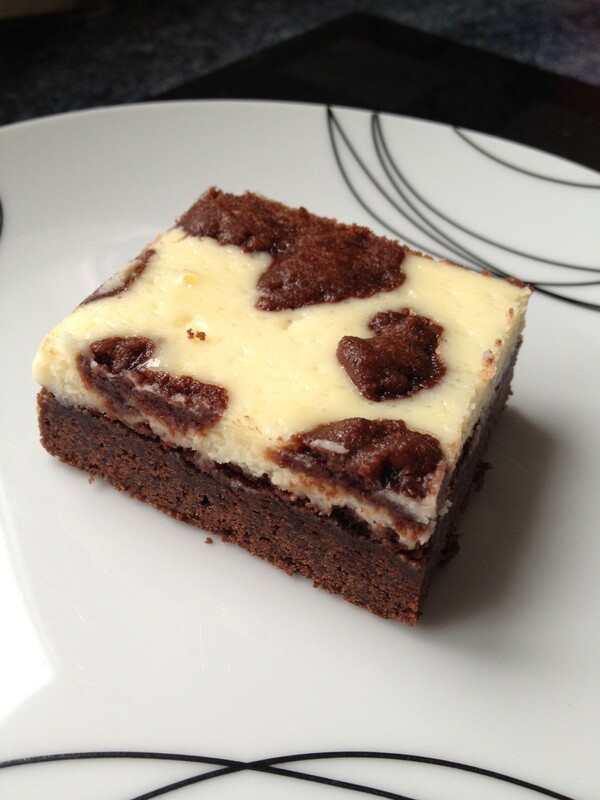 It’s a really simple, but pretty impressive brownie/cheesecake combo. Lovely for either a treat with a cuppa or as a dessert, it would be gorgeous with a scoop of vanilla ice cream, although, in my opinion, most things are great with a scoop of vanilla ice cream! I would say, that while it’s a simple recipe, it is quite time consuming as it needs chilling time between a lot of the steps, so it’s not one that you can quickly pull together, so ensure you leave yourself plenty of time. 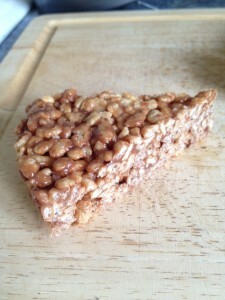 The recipe makes 12-15 bars and uses one 23x30cm (9x12in) baking tray. Using a hand-held electric whisk or a freestanding electric mixer with the paddle attachment, cream the butter and sugar together until light and fluffy. Add the effs one at a time, mixing thoroughly after each addition and scraping down the sides of the bowl to make sure every bit of the mixture is incorporated. Sift together the remaining ingredients, then tip these into the batter into two batches, mixing in the freestanding mixer or folding in by hand. Cut off approximately one-quarter of the dough, cover with cling film and place in the fridge. 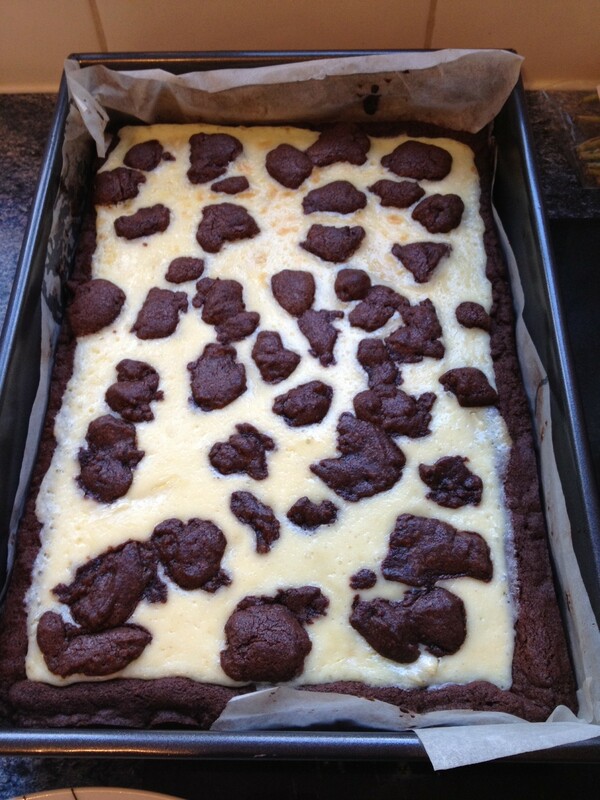 Line the baking tray with baking parchment, then press the remaining dough into the tray, it’s useful if you create a bit of a raised lip around the edge of the tin to hold in the cheesecake mixture when this is poured in later. Allow it to set in the fridge for 20-30 minutes. Meanwhile, preheat the oven to 170 degrees C (325F), gas mark 3. Remove the base from the fridge and bake for 20-25 minutes. Allow to cool completely in the tin before adding the topping, but keep the oven on for cooking the finished cheesecake. Melt the chocolate in a glass bowl over a saucepan of simmering water then remove from the heat and allow to cool slightly. 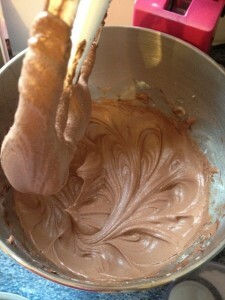 Using the electric whisk or freestanding mixer with the paddle attachment, mix the cream cheese and sugar until smooth. Add the egg and mix thoroughly, then stir the melted chocolate into the cheesecake mixture by hand. Spread the mixture on to the cooled base, then remove the reserved dough from the fridge and crumble in large pieces over the cheesecake. Bake for approximately 25 minutes or until the cheesecake has set, then allow to cool completely before placing in the fridge for a few hours to set. Once set, cut the cheesecake into squares or rectangles to serve. This is best served when it’s been removed from the fridge and been able to come up to room temperature a bit. It’s quite hard when it comes straight from the fridge so I would take out at least half an hour before you intend to serve. 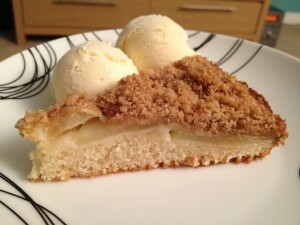 I am a big fan of apple desserts. Apple pie warm with ice-cream is one of my favourite desserts and no matter how much I’ve eaten, if that’s on the menu, I’ll find room! 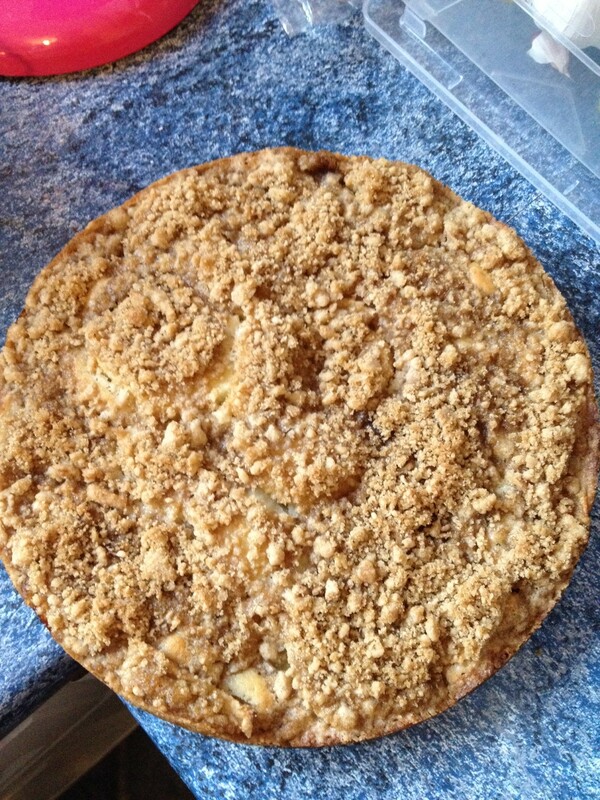 This cake is basically a mix between an apple crumble and a cake. In my eyes, that has to be a winner so when my parents came to visit this weekend, I thought it would be the perfect opportunity to give it a whirl! Needless to say, it did not disappoint and turned out perfectly. I have a feeling this easy recipe will become a household favourite! First make the streusel topping. Sift the flour and the ground cinnamon into a bown. Add the butter and using your fingertips, rub the ingredients together until they resemble breadcrumbs. Stir in the sugar and set aside while you make the sponge batter. Using a hand-held held electric whisk or free-standing electric mixer with the paddle attachment, cream together the butter and sugar until pale and fluffy. Add the egg and vanilla essence, and mix thoroughly, scraping down the sides of the bowl to ensure all the ingredients are fully incorporated. Sift the flour, baking powder and salt, then add half of this mixture to the creamed butter and sugar, followed by half the milk. Mix well on a medium speed after each addition, scraping down the sides of the bowl, then repeat with the rest of the dry ingredients and the milk. Pour the batter into the prepared cake tin. Peel, core and slice the apples into quartered and each quarter into three or four slices, depending on the size of the apples. Arrange the slices in concentric circles on top of the cake batter, then sprinkle with the streusel topping, making sure it forms an even layer. Place in the oven and bake for 35-45 minutes or until it is golden brown on top and a skewer inserted into the middle of the cake comes out clean with no uncooked mixture sticking to it. 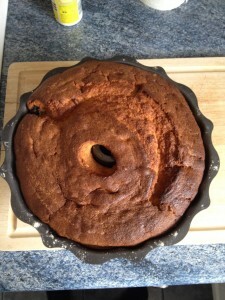 Set aside to cool and then remove from the cake tin. 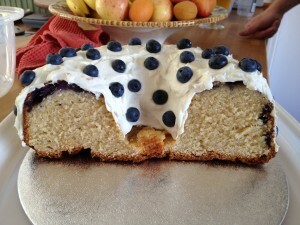 This cake can be enjoyed warm or cold. 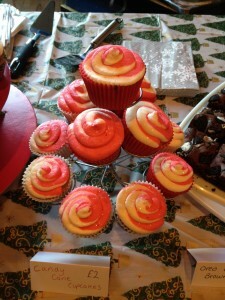 A few weeks ago it was my second Clandestine Cake Club event, and the theme was Americana. I knew pretty quickly that I wanted to attempt the Hummingbird Bakery’s Brooklyn Blackout Cake as I’d had my eye on this bad boy in all it’s chocolatey glory for a while! I had intended to try a trial run, but unfortunately I just didn’t find the time in the run up to the event, so the night before I took to the kitchen and hoped for the best! 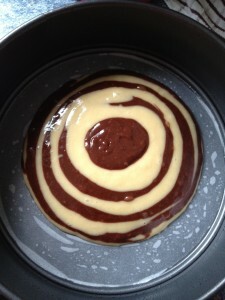 I was planning on doing the sponges the night before and then doing the chocolate custard the following morning and assembling it, however in the end I decided to do the custard the night before as well and let it cool over night, I would really recommend that if you try this recipe you do the same. The custard needs a long time to cool and thicken and so it’s not really something you can do in a rush. As you’ll see from the pics below the consistency of the custard changes once it’s cooled properly so had I left it until the day I wanted to assemble it, I would have had a bit of a nightmare. Once assembled the cake needs 2 hours chilling in the fridge, so ensure you leave yourself plenty of time before you’re planning on serving it! Preheat the oven to 170 degrees C (325 Degrees F) Gas 3. Put the butter and sugar in a freestanding electric mixer with a paddle attachment (or use a handheld electric whisk) and cream until light and fluffy. Add the eggs one at a time, mixing well and scraping any unmixed ingredients from the side of the bowl with a rubber spatula after each addition. 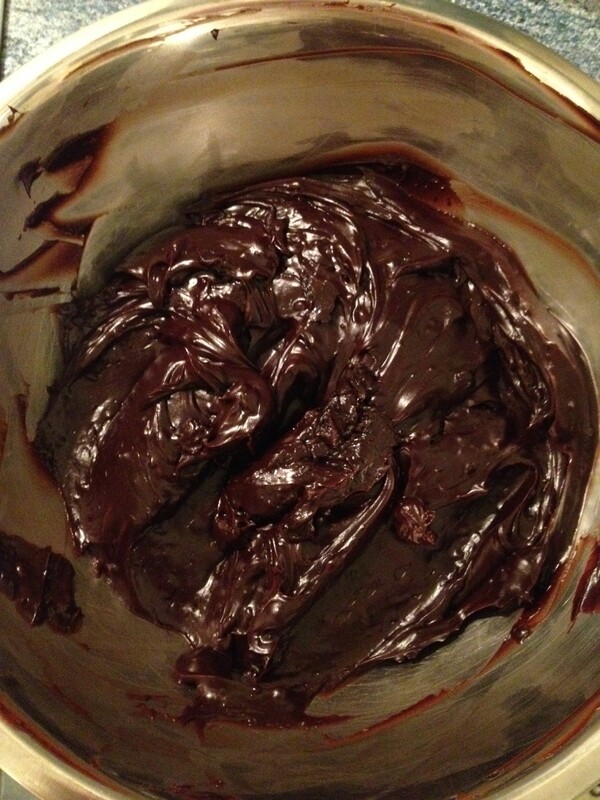 Turn the mixer down to slow speed and beat in the vanilla extract, cocoa powder, baking powder, bicarbonate of soda and salt until well mixed. Add half the flour, then all the milk, and finish with the remaining flour. Mix well until everything is well combined. 3. Pour the mixture into the prepared cake tins and smooth over with a palette knife. 4. Bake in the preheated oven for 25-30 minutes. 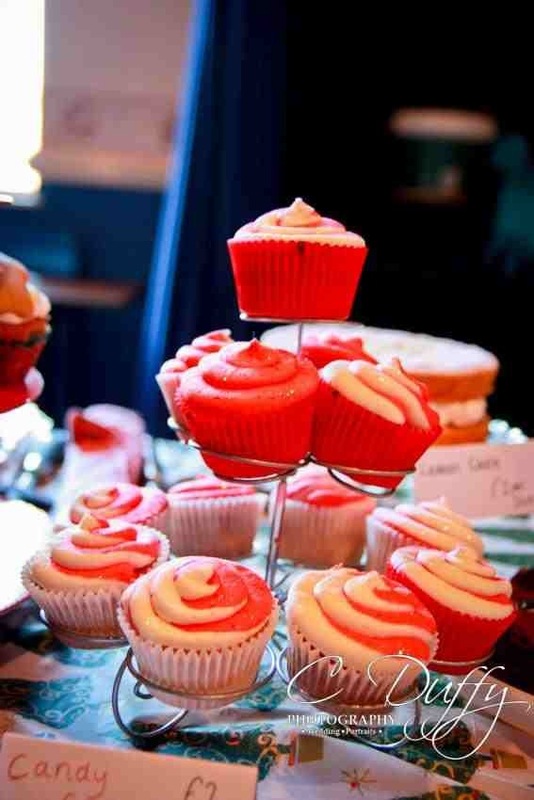 Leave the cakes to cook slightly in the tins before turning out onto a wire cooling rack to cool completely. 5. 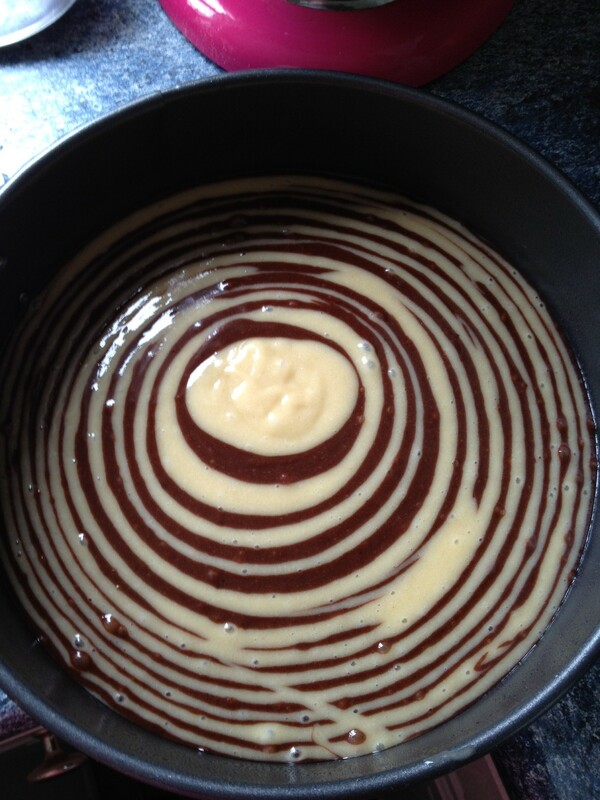 For the Chocolate Custard: Put the sugar, golden syrup, cocoa powder and 600ml water into a large saucepan and bring to the boil over a medium heat, whisking occasionally. I would recommend you use a BIG saucepan for this as later on the mixture does grow considerably and I found myself having a frantic rush tipping it into a big pot to avoid it spilling over the edge of a smaller pan I’d started with! 6. Mix the cornflour with 120-200ml water, whisking briskly as you add the water. The mixture should be the consistency of thick glue so add more water if it’s too thick (do not exceed 250ml). 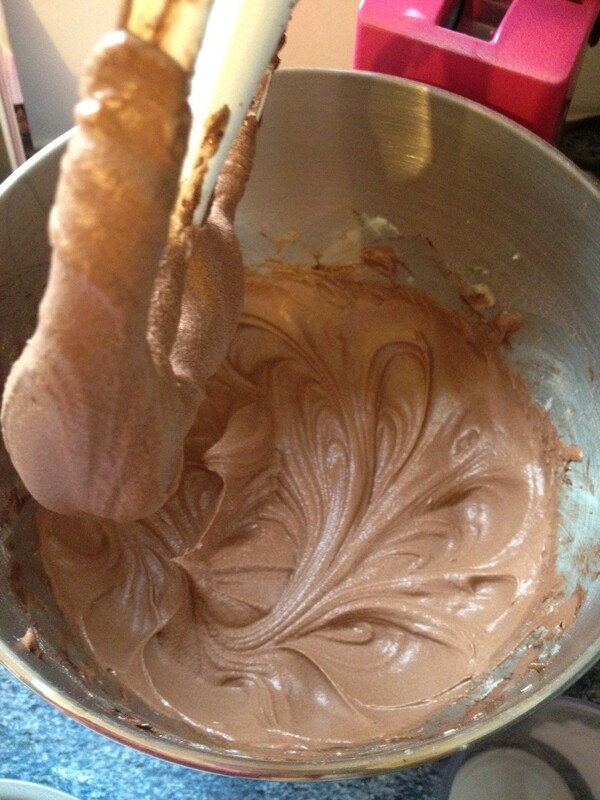 Whisk gradually into the cocoa mixture in the pan over a medium (not high) heat. Bring back to the boil, whisking constantly. Cook, whisking constantly for a few minutes until quite thick. Remove from the heat and stir in the butter and vanilla extract. Pour into a bowl, cover with cling film and chill until very firm. I took the cake out of the fridge for about an hour before I served it which allowed it to return to room temperature a bit. 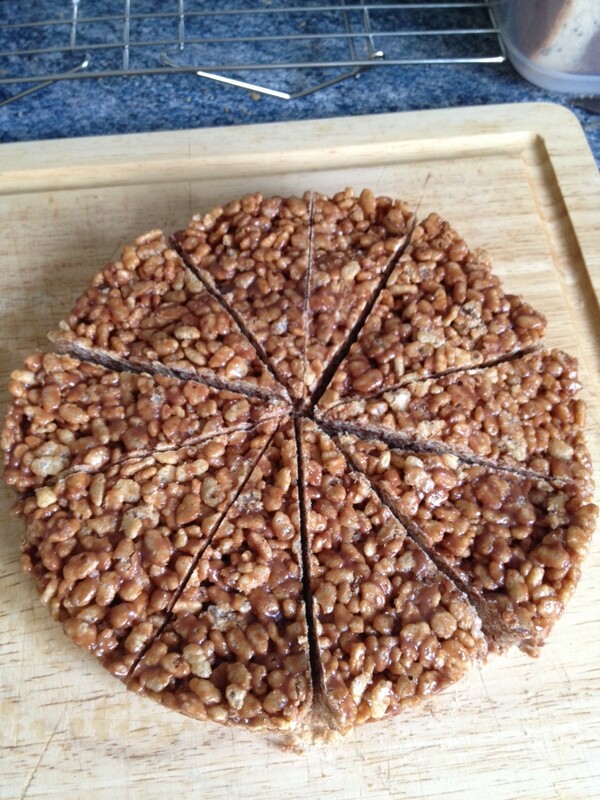 It was without a doubt one of the richest chocolate cakes I have ever tasted. 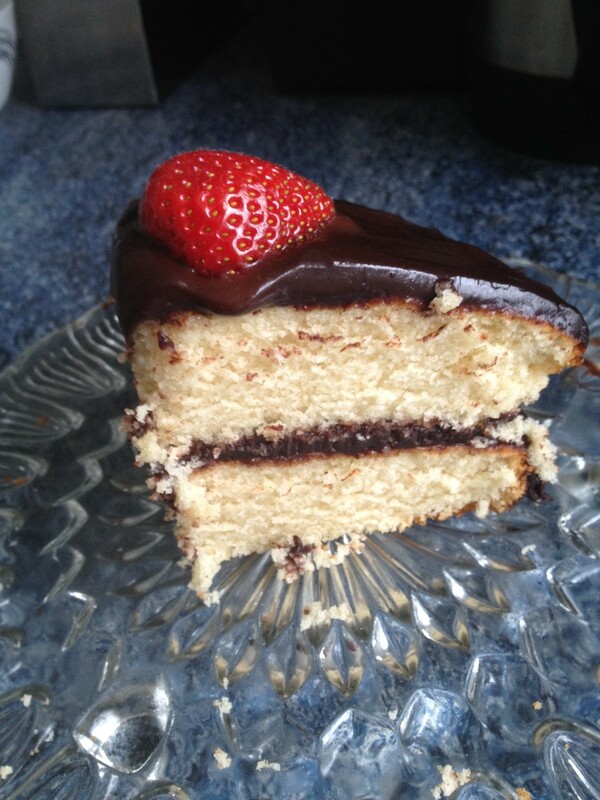 I found that there was a lot of leftover chocolate custard so I actually made 2 layers of vanilla sponge the following day when I had some family over for lunch and used it to fill and top that, which was a great combination and wasn’t quite as rich. Another great use for the custard would be to heat it up and pour over ice-cream! Delicious!! This was a no cook, very easy recipe and for only 3 Weight Watchers Pro-Points per serving I figured I’d give it a try and it could be a good lunch box treat for work. 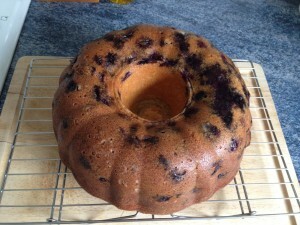 It makes 10 slices and will keep up for a week in the fridge in an air tight container. 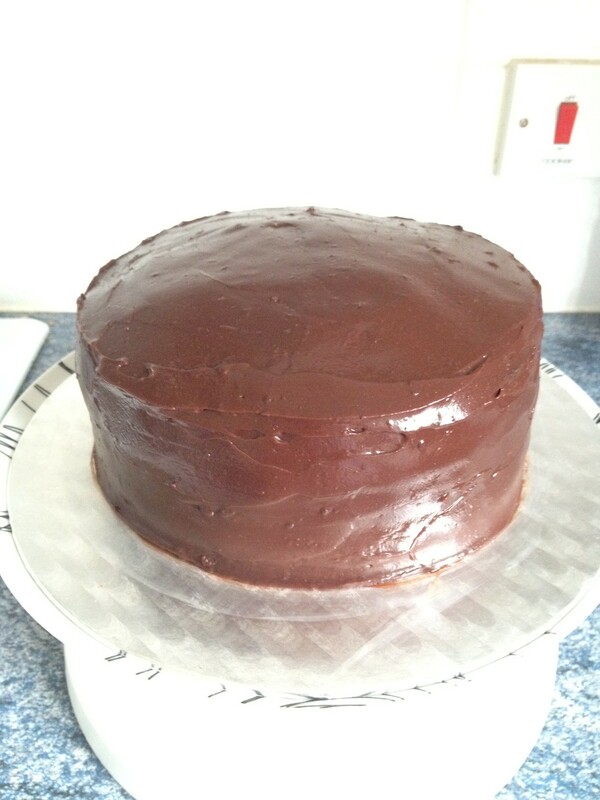 Line the base of an 18cm (7 inch) loose-bottom cake tin with non stick baking parchment. Put the chocolate, peanut butter and golden syrup in a large saucepan, stir and gently heat until melted. Add the cereal and stir to coat the mixture. Spoon into the prepared tin and level with the back of a spoon. Chill in the fridge until set, then cut unto 10 wedges. 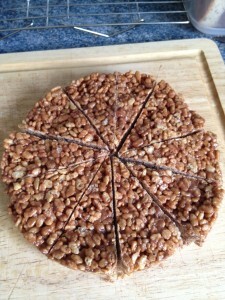 Super simple low fat treat. If you’re not so worried about the points then I’d suggest adding a little extra chocolate as, let’s face it, anything with only 3 weight watchers points is going to be slightly limited in the chocolatey stakes! However, for a guilt-free treat if you’re point counting it’s pretty good! It’s been a while since my last post, I’m still getting used to finding the time to blog! 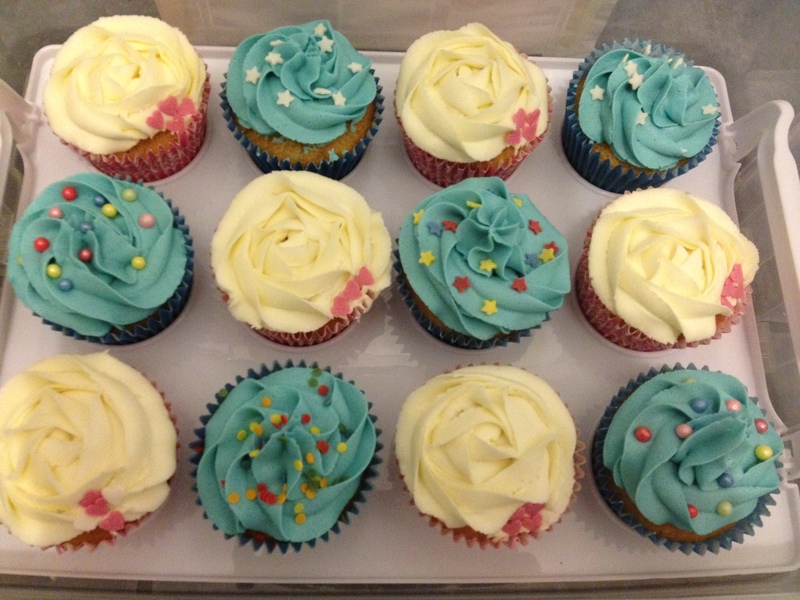 I’ve had quite a busy week so not had much time to bake since last Thursday night when I made some vanilla cupcakes for a colleague who was leaving to go and work in Sydney! I promised I would make him some of my usual vanilla cupcakes, so I couldn’t let him down. I’m a cupcake girl at heart really when it comes to baking, and the Hummingbird bakery cupcake recipes are really what started my love of baking a few years ago. The vanilla cupcakes are my go to, tried and tested baked good of choice, and they never let me down! 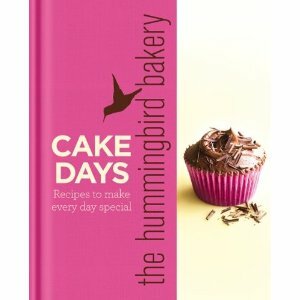 I have the two Hummingbird recipe books, and they use different quantities for the vanilla cupcakes recipe, so I tend to use the quantities from the ‘Cake Days’ book, which when using big ‘muffin’ type cupcake cases tends to make about 16. If you want to colour the frosting then divide into separate bowls and add drops of food colouring to each bowl little by little to build up to the desired shade. 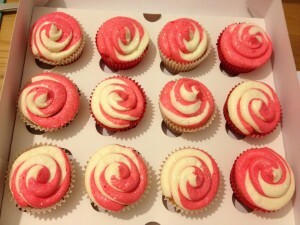 Once the cupcakes are cool, add the frosting, either smoothing and swirling with a palate knife, or by putting the frosting into a piping bag with nozzle and piping the frosting in a swirl on top. The nozzles that I used for the decorating was a Wilton 1M for the blue swirls, piped from the edge of the cupcake to the centre, and for the white roses, I used a Wilton 2D, starting in the centre of the cupcake working out and around to the edge. The edge where the piping ends can look a little messy where it ends, so I placed a few heart shaped sprinkles to decorate and cover this up a little! 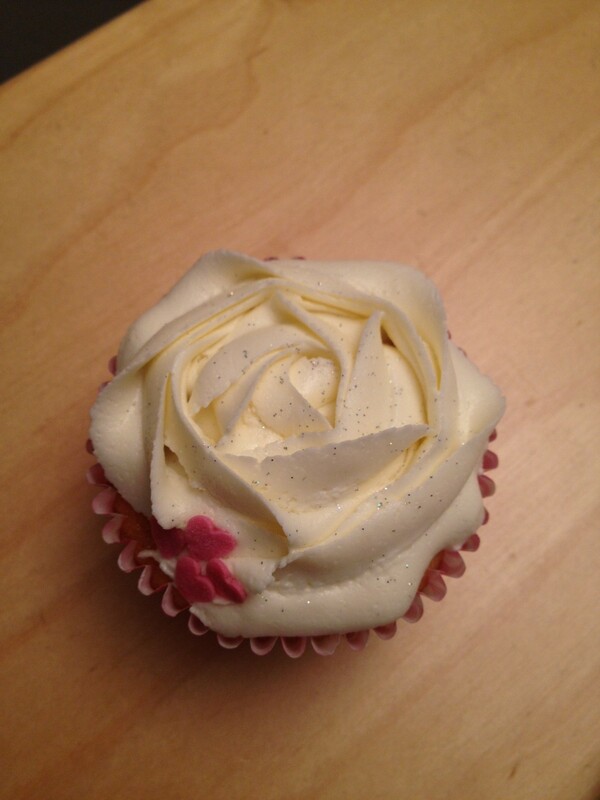 Then I sprinkled with a little edible glitter and there you go! 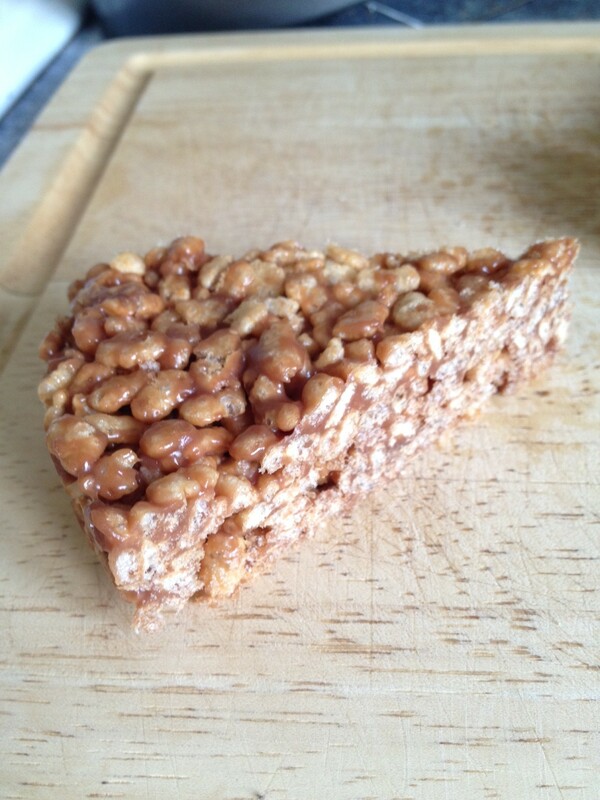 They are a real favourite in our household and really very simple to make! Tonight we had a delicious dinner! It’s a Weight Watchers recipe which I tweaked slightly, adding broccoli & spring onion to beef it up a little and add some lovely greens! It is so easy to make, doesn’t take long at all so is a great mid week healthy, low fat dinner! Here’s the recipe, I hope others enjoy it as much as we did! Meanwhile, heat a non stick frying pan and spray with cooking spray. Add the onion, pork & broccoli and stir-fry for 4 minutes over a high heat until the pork starts to brown. Mix together the orange juice, chilli sauce, ginger and soy sauce. Add this mixture, plus the drained noodles, to the frying pan and cook for 1 minute, stirring to coat and mix together. Add the spring onion and mix through. Transfer to bowls/plates and sprinkle with the chopped coriander and serve. 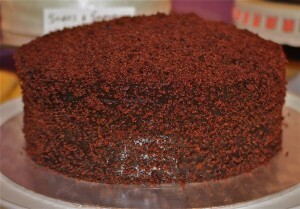 The prep for the cake was really simple, everything just got mixed in together and then into the prepared tin. One thing I did find with this recipe, which I will remember for this time, was that there was a bit too much mixture. I followed the quantities provided, but really the tin was over full. I have since been advised (by expert bundt baker DollyBakes!) that the tin should only be about 3/4 full, so I may need to invest in some mini bundt tins in case I have excess mix in future. The result of an over full tin in this instance was that I had to leave it in the oven for an extra 30 minutes as it just wasn’t cooking through, and as the mixture rose it all squished out of the pan a little, meaning that there wasn’t a clean circle gap in the middle which you can see in the pics, but all in all I was very pleased with the first attempt. 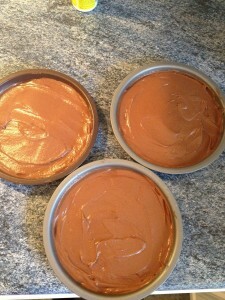 Pour the mixture into the prepared ring mould and smooth over with a palette knife. Bake in the preheated oven for 40 minutes or until golden brown and the sponge bounces back when touched, (I also checked that a cake tester came out clean when inserted through the deepest part of the cake). 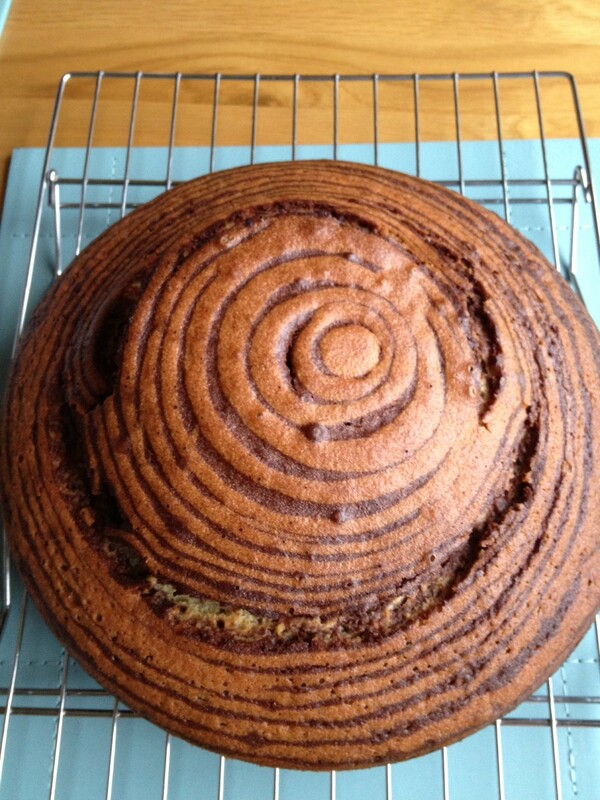 Leave the cake to cool slightly in the tin before turning out onto a wire cooling rack to cool completely. When the cake is cold, put it on a serving plate, cover the top & sides with the cream cheese frosting (see below for preparation instructions) and decorate with more blueberries. Dust with a light sprinkling of icing sugar. Add the cream cheese in one go and beat until it is completely incorporated. Turn the mixer up to medium-high speed. Continue beating until the frosting is light and fluffy, at least 5 minutes. Do not overbeat as it can quickly become runny. The end result was lovely. If I’m honest, it doesn’t really need the frosting as it’s a lovely moist tea time treat without and is perfect with a cup of tea. However, it does have a little more ‘Wow’ factor with the frosting as it looks fantastically impressive! The blueberries sink to the bottom of the tin whilst baking, but when turned out this becomes the top and so when cut, the cross section of the cake looks lovely. 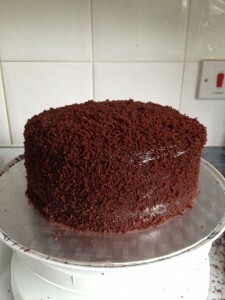 One thing I would advise is that as it’s a pretty big cake it does need quite a long time to cool, so if you give it a try, and intend to frost it, ensure you leave plenty of cooling time in between. At least a few hours! So as part of my love for food I enjoy posting pictures of my cooking & baking adventures on my Instagram (feel free to check out my page @cupcake_queen_84). 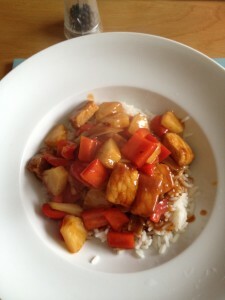 Last night I posted a picture of a fantastic recipe I tried for the first time last night, Sweet and Sour Pork. 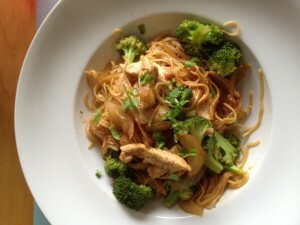 It tasted better than a take away sauce, and it’s actually much healthier! One of my Instagram followers asked me to share the recipe, so here it is! 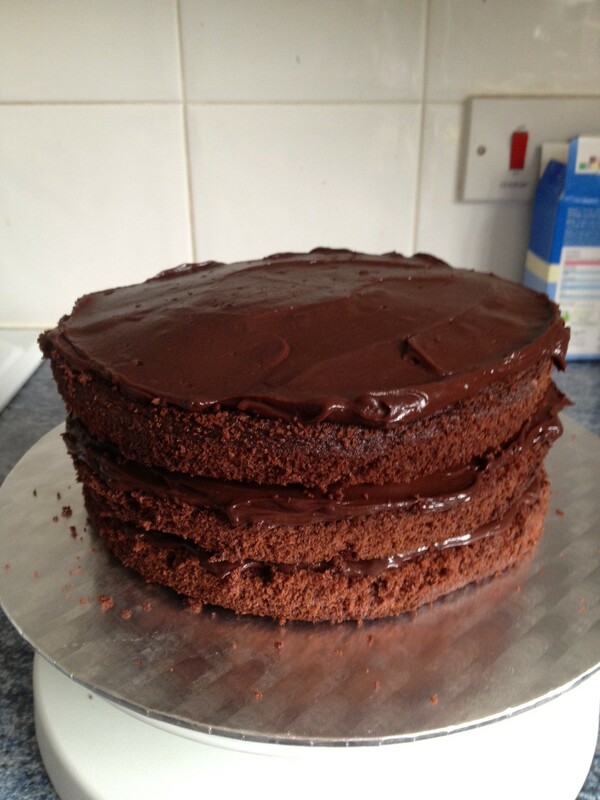 Recipe serves 4 and it’s 7 Weight Watchers Pro Points. Serve with 40g long grain rice per person for an extra 4 Pro Points. In a bowl, add the wine and soy sauce and toss the pork to coat in the mixture. Set aside. Meanwhile, for the sweet & sour sauce, put the cornflour into a small saucepan and gradually stir in 100ml cold water, the sugar, soy sauce, vinegar and ketchup until smooth. Heat gently for about 3 minutes until just thickened. Set aside. Remove the pork from it’s marinade, reserving the marinade. Place on a plate and dust with the cornflour. Heat a non stick frying pan until hot and spay with the cooking spray. Cook the pork for 3 minutes, stirring until browned. Add the pepper and spring onions and cook for 3 minutes until just softening. Stir in the pineapple and sweet & sour sauce and reserved marinade. Bring to the boil and, as soon as it’s bubbling serve immediately.